Where to go to sip some of the most splendid regional vinos? Some splendid locations, starting with Dana Point. FOAM ON TOP OF THE BREW? The CA Brew & BBQ bash is part of the line-up, making for a five-fabulous festival circuit. That's the second-to-last lark, so you'll likely want to start with the California Wine Festival that's visiting Dana Point in late April, if you hope to be a completest and call upon all of the wine-sipping spectaculars. 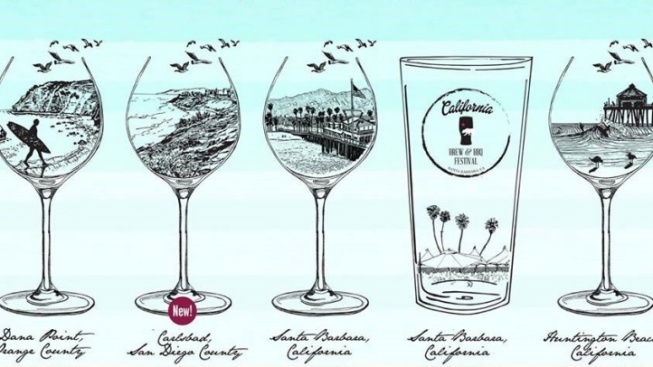 A Sunset Rare & Reserve Tasting visits Carlsbad on the first two days of summer, while a Sunset Rare & Reserve Tasting will line up the glasses in Santa Barbara on July 19 and 20. The CA Brew & BBQ foams in Oceanside at the end of September, while Huntington Beach is the final stop, in late October. SO MANY WINERIES ATTEND, and brewmakers, too, that finding out if your favorite places, or the labels you've been meaning to try, is as easy as keeping an eye on the site. You can do so here. Will you visit all five this year? It's one of the biggest beverage tours around, and one that has become known for quality and creating fresh fandoms of some of our state's great wines.